Amish furniture craftsmen have long prided themselves with their offerings of timeless furniture styles. And the ‘big three’ designs have changed little in the past century. “Big three’ refers to Shaker, Mission and Country styles. Yet, the beauty of these designs continues to inspire furniture-enthusiasts, decade after decade. Many craftsmen choose to rest on their laurels. But Amish artisans continuously push the creative envelope with modern, cutting-edge furniture designs. And Classic and Modern: Amish Furniture Double-Take gives a vivid example of the Amish artisans’ creativity. The Montreal Table boasts a stunning, modern design. And it features flush storage drawers and an extendable top. Also, this minimalist table possesses a distinctly modern style. The Wilmington Table, by contrast, boasts a classic design (pictured below). 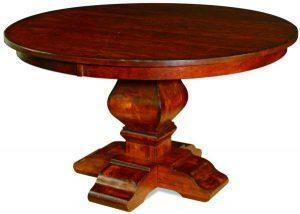 Also, an impressively-crafted, sturdy pedestal marks this traditional table. A traditional, carved base accents the classic Wilmington Table. So now we’d love to hear your opinion: Which furniture style do YOU prefer — classic or modern? Also, make sure to check out Brandenberry Amish Furniture. And take a few minutes to browse the complete selection of both classic and modern furniture designs. Or, visit Brandenberry’s ‘brick and mortar’ store in Shipshewana, Indiana. Because you’ll be able to see the top-quality, custom-built, solid hardwood Amish furniture firsthand.